What's On His Book Shelf? I’m a book person. I can’t resist checking out the books on display in other people’s homes or offices. When I was a student, I’d like to check out what my teachers and professors have read. It’s not that I’m trying to understand someone by seeing the books that they read, but I’m just always curious to know what’s on their book shelf. When I moved to my current apartment five years ago, I threw away my old book shelf and a large number of books. There are still some books that I kept, but they are still packed in boxes in my store room. I don’t have time to read them now, sadly. Career and motherhood have taken up most of my time. Nonetheless, I still hope that I can set-up my book shelf again, and with my collection of books. 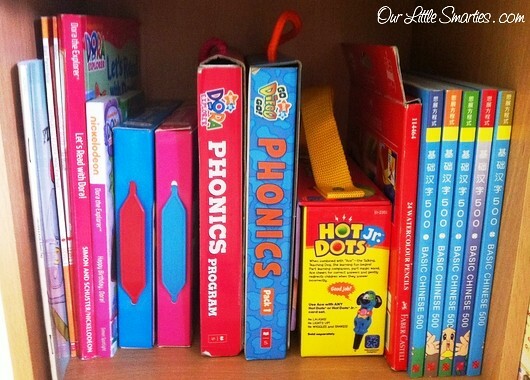 And today, I’m going to show you Little Edison’s mini book shelf. It’s all full now. It’s time for me to hunt for a bigger book shelf for him. Top Left – It’s occupied with his stationeries and recently, we bought him two sets of Crayola marker and crayon sets. He loves to draw and colour with them. 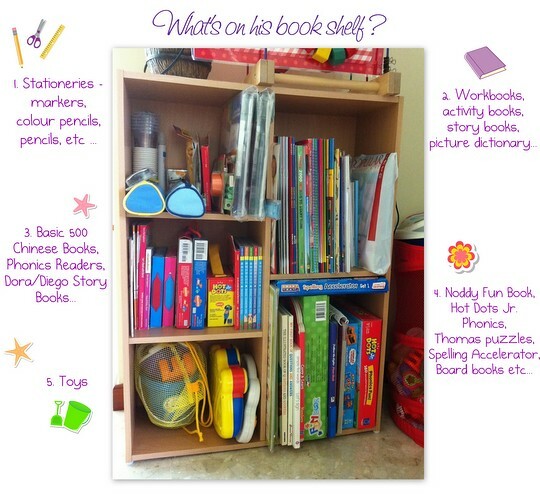 Top Right – We have plenty of workbooks, activity books and story books here. 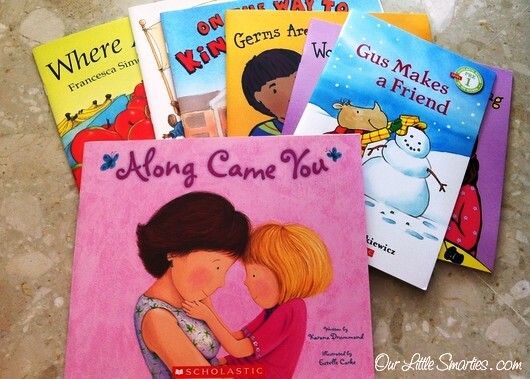 I bought most of these Scholastic story books from his school – they are interesting and easy to read for preschoolers. Oh, we have two picture dictionaries too. Center – I also bought the Basic Chinese 500 books for him, but he is least interested to read them. Honestly, I find them quite boring too. His favourite books are the Dora and Diego Phonics Reading Program. 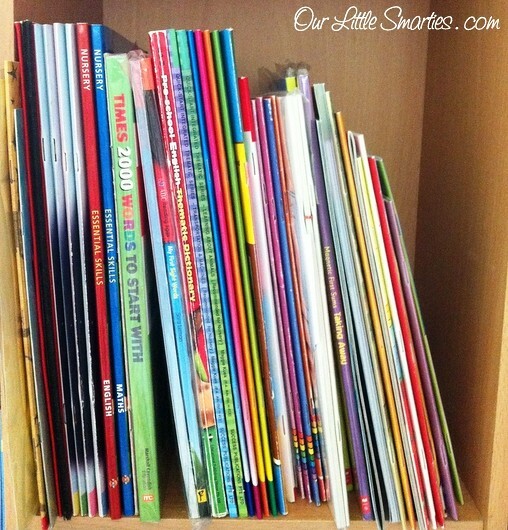 There are ten short story books in a pack, which is good for developing reading skills and identifying words. He likes to read them over and over again. 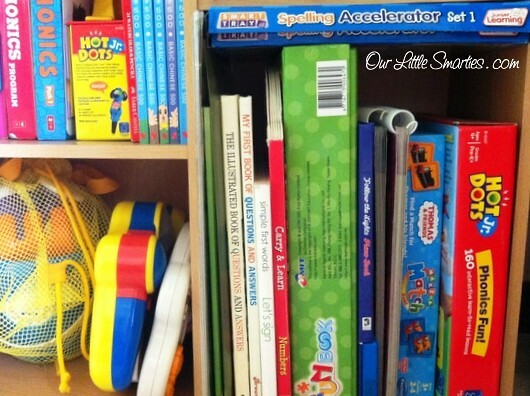 Bottom Right – I put all his board books and other educational games here – Noddy Fun Book, Smart Tray Spelling Accelerator, Hot Dot Jr. Phonics Fun Game, Thomas & Friends matching puzzle etc.